Eastern freshman Kennadi Rockhold (left) shoots a layup in front of Lady Falcons Ashtyn Russell (center) and Emma Gibbs (11), during the first half of the Lady Eagles’ 62-44 victory on Monday in Mason, W.Va.
Wahama senior Elizabeth Mullins (22) dribbles in front of Eastern junior Jess Parker (2), during the second half of the Lady Eagles’ 62-44 victory on Monday at Gary Clark Court in Mason, W.Va.
MASON, W.Va. — Momentum is a powerful thing. 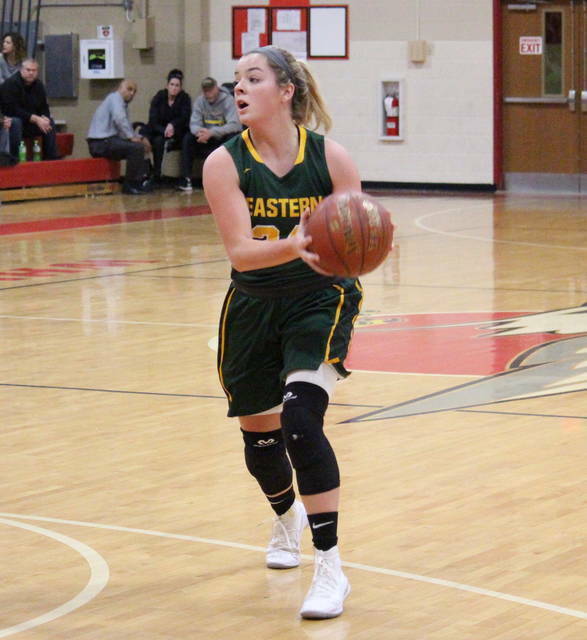 The Eastern girls basketball team picked up its fifth straight victory on Monday night at Gary Clark Court, defeating Tri-Valley Conference Hocking Division host Wahama by a 62-44 tally, giving the Lady Falcons their fifth straight setback. Eastern (12-5, 10-2 TVC Hocking) scored the game’s first 10 points, holding Wahama (4-11, 2-11) scoreless for 4:50 to start the night. The Lady Falcons bounced back with a 10-to-4 run, however, cutting the Lady Eagle lead to 14-10 by the end of the first quarter. WHS sank a two-pointer to open the second period, cutting Eastern’s lead back to one possession. However, EHS answered with a 10-0 run, stretching its advantage to 24-12 with 3:45 left in the half. The Lady Falcons ended the half with an 8-to-5 spurt, and went into the break with a 29-20 deficit. The teams played evenly in the third quarter, both teams scoring nine points to make the EHS lead 38-29 with eight minutes to go. The Lady Eagles outscored the Lady Falcons by a 6-2 clip in the first 2:10 of the finale, but Wahama answered with a 7-1 run, trimming the margin to 45-38 with 4:00 left in regulation. The hosts didn’t make it any closer than seven, as Eastern closed the 62-44 win with a 17-6 run. The guests shot 26-of-69 (37.7 percent) from the field, including 3-of-8 (37.5 percent) from three-point range, while Wahama was 15-of-42 (35.7 percent) from the field, including 1-of-9 (11.1 percent) from beyond the arc. At the free throw line, EHS shot 7-of-16 (43.8 percent) and WHS shot 13-of-24 (54.7 percent). The Lady Falcons won the rebounding battle by a 41-to-35 count, despite EHS taking a 24-to-19 edge in offensive boards. Eastern also held advantages of 18-to-2 in assists, 21-to-3 in steals and 3-to-2 in blocked shots. The Lady Eagles turned the ball over 14 times in the game, while Wahama committed 38 turnovers. EHS junior Alyson Bailey led the victors with 14 points and five assists, followed by Elizabeth Collins with 12 points and nine rebounds. Jess Parker and Madison Williams both had nine points and five assists, with Williams sinking a pair of three-pointers. 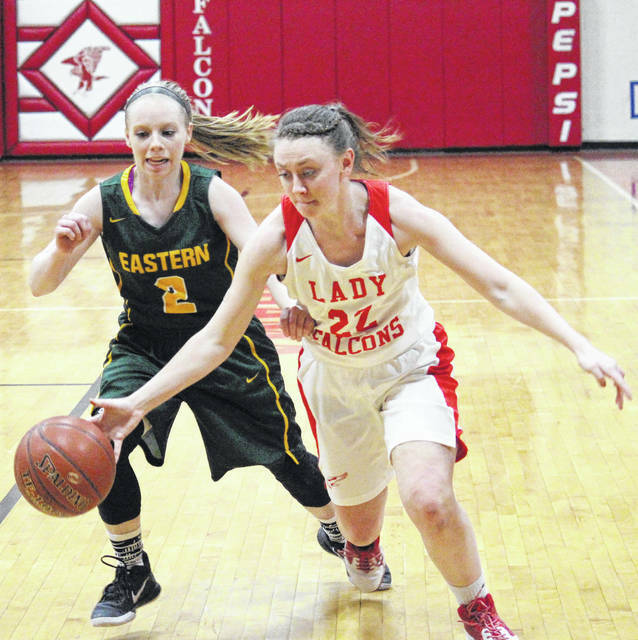 EHS senior Kaitlyn Hawk had seven points, including three from long range, while Olivia Barber had five points and eight boards in the win. Kennadi Rockhold and Kelsey Casto rounded out the Lady Eagle scoring with four and two points respectively. Bailey also led the guests on defense with six steals and one block, followed by Parker with five steals. 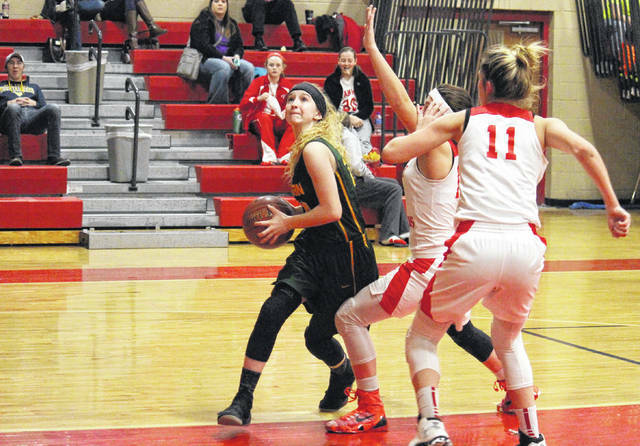 WHS sophomore Hannah Rose hit the team’s lone three-pointer and led the way with 18 points. 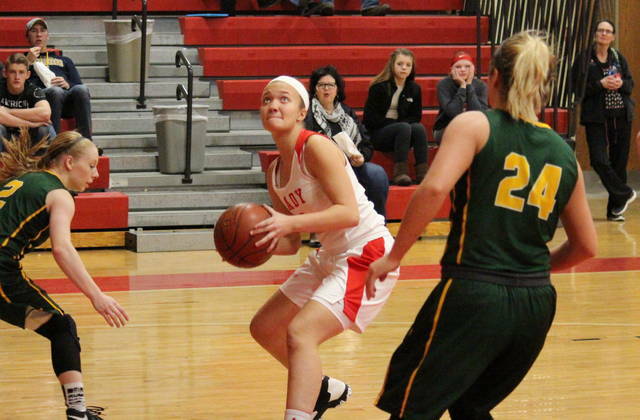 Emma Gibbs recorded 15 points and 19 rebounds in the setback, while Harley Roush and Gracie VanMeter both scored four points, with Roush grabbing five boards. Victoria VanMatre had two points for the hosts, while Ashtyn Russell had one point and five boards. Roush and Elizabeth Mullins both recorded an assist for WHS, while Rose led the defense with two steals. This is the seventh consecutive year that the Lady Eagles have reached double-digit league wins. The Lady Eagles won their first meeting with the Lady Falcons by a 62-26 count on Dec. 18 in Tuppers Plains. In a late addition to the schedule Wahama will host Crooksville on Thursday. The Lady Eagles are back on their home court on Thursday, welcoming Federal Hocking.